I have noticed three types of people who were waiting for the Kingdom of God. One of these people was Simeon…a good man, very devout, and filled with the Holy Spirit. The Holy Spirit revealed to Simeon that he would not die until he had seen Him- God’s appointed King. Can you imagine the joy of these two people as they recognized there was a transition about to take place. This trasition time would be understood by some and misunderstood by many. When John Schrock first shared with me the vision that he had about La Red, he began explaining the Kingdom of God. I was like so many of you, a business leader, involved in the church, with respect for the people that functioned like Simeon and Anna. I felt that my job was to support them, and to be part of the vision of our church. John told me that a major transition was about to take place and challenged me to participate in the vision. He told me that there would be men and women who were prepared, not plagued by former things, and how they would have insight into what God was doing in our day. John said that this new breed would look like lions, but have hearts like lambs. They would attract and find favor with great leaders of our time. I searched for a profile of such a man in the Bible, and I found it in Joseph of Arimethea. I have always wanted to meet Joseph of Arimethea, one of the men who took Jesus down from the cross. Everyone else had deserted Jesus, but Joseph understood that He was a good man, and that He represented something powerful and historic in mankind. Can you imagine the excitement that I had when I came across Arthur Hadley’s book on the Moral Basis of Democracy. 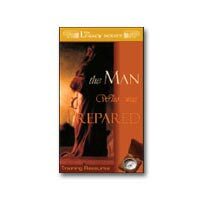 I was moved as I read a chapter entitled, The Man Who was Prepared. I present it now to you as the first part of our series on Ethical Leadership. I have taken the liberty to adjust some of the sentence structure to make the reading easier. The content and meaning has not been changed. John Schrock has told us that there would be men and women “prepared and not plagued by former things.” Keep that in mind as you read this treatise shared at Yale University in 1913. Arthur Hadley will take you back to a time when God was about to change the hearts of men. Hadley’s words resound in my heart and mind today. I challenge you to be one of those who are prepared to usher in the Kingdom of God. You may one day stand in the ranks of Simeon, Anna, and Joseph of Arimethea when you understand that God has given you a place and a platform to proclaim this news to the marketplace. Let us now meet Joseph of Arimethea through the eyes of Arthur Hadley.